KTM updates Super Duke GT for 2019 – at last! 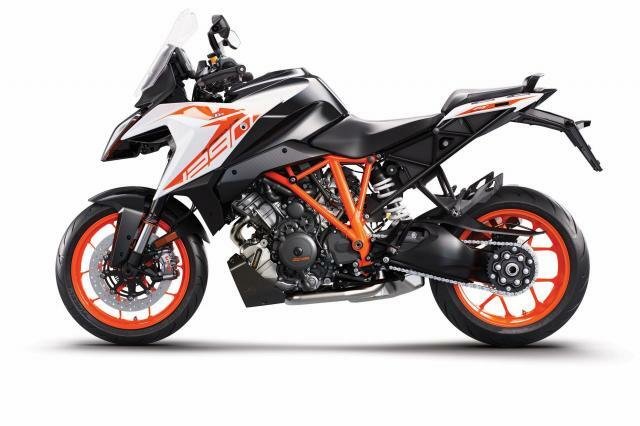 After taking a back seat to various smaller capacity bikes, at long last the Austrian lunatics at KTM have updated the Super Duke GT. Amid a barrage of new bikes coming out of Intermot, the Super Duke GT finds itself sporting new electronics and more power for 2019. And that’s fine by us. Thanks to revised resonator chambers, titanium inlet valves and a new map installed into the ECU, it now pumps out 175 HP and 104 lb-ft of torque. It also comes with a bi-directional quickshifter as standard, a TFT screen (goodbye analogue tachometer) as well as a new headlight design. The WP electronic suspension also sees updates to the latest semi-active system, meaning it still has 3 damping modes and adjustable preload at the touch of a button. That’ll keep us all happy for another few years for sure.